The earlobe is composed of tough areolar and adipose connective tissues, lacking the firmness and elasticity of the rest of the pinna. The earlobes are normally smooth, but occasionally exhibit creases. 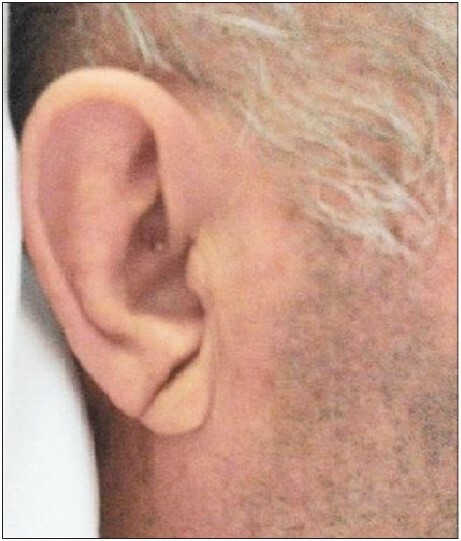 The diagonal earlobe crease (DELC) is a fold or crease in the skin of the earlobe [Figure 1] and was first suggested to be associated with coronary artery disease (CAD) in 1973 by Frank,  and after that, this crease was called Frank's sign. Since Frank's original study, several clinical studies, including autopsy-based  and histopathological examinations,  have shown an association between ELC and CAD , and support the hypothesis that ELC was related to CAD. The ELC is useful as a risk factor of CAD, because it can be seen at a glance. On the other hand, several studies reported negative results and suggested that it is simply a marker of advancing age ,, and the lack of a theoretical foundation for a causal relationship between ELC and atherosclerosis inhibits the clinical value. Hence, the aim of the present study was to evaluate the frequency of DELC in patients with CAD. In this cross-sectional study 100 patients with proven CAD (who had undergone angiography and were found to have CAD) at the Tehran Heart Center from October 2009 to March 2010 were included in the study. Body mass index (BMI) was calculated by body weight (kg)/height (m 2 ). Blood pressure was measured on several occasions during hospital stay and hypertension was defined as systolic blood pressure ≥140 mmHg or diastolic blood pressure ≥90 mmHg; or use of antihypertensive medications. Patients on treatment with lipid-lowering drugs or with abnormal lipid profile were classified has having hyperlipidemia, and patients with elevated serum glucose level or on treatment for diabetes, was considered to be diabetes. Current smokers were defined by self-report of cigarette smoking during the year prior to study. A total of 100 patients were enrolled in this study. The mean age was 64.83 ± 9.58 years; 56 (56%) were men, and 44 (44%) were women. The prevalence of DELC was 62% (95% confidence interval 59.7-64.6). The age of 61 (61%) patients was 60 years and older, and DELC was seen in 68% of patients ≥60 years old. The difference between two age groups (<60; and ≥60) was not statistically significant (P = 0.127). 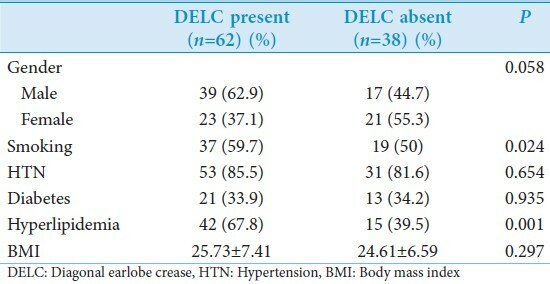 In these patients, 69.6% of male and 52.3% of female had DELC. No differences were observed between the two groups with regard to gender (P = 0.058). On the basis of the results shown in [Table 1], the frequency of smoking and hyperlipidemia was significantly higher in patients with DELC (P = 0.024 and P = 0.001, respectively). However, frequency of hypertension and diabetes were not significantly different between the two groups. In addition, comparison of the mean of BMI between the two groups showed that no significant difference. The current study showed that the frequency of ELC was high in patients with CAD. In Raman study, the ELC was observed in nearly 60% of the urban south Indian population. In Australia, Davis et al. reported that the prevalence of ELC was 55% in CAD patients. A study by Edston  of autopsy cases, the existence of a DELC was noted in 55%. It was found that ELC was strongly correlated with CAD in both men and women. The results of Kwai-Ping Suen et al. study  showed that the presence of ELC was significantly associated with CAD. A study by Elliott and Karrison  found similar results. They suggest that a DELC is associated with increased all-cause and cardiac morbidity and mortality. Bahcelioglu et al. found that there was a statistically significant positive association between ELC and these diseases in both sexes. Kaukola evaluated 219 patients with CAD in Finland and reported that 69% of the men and 69% of the women had a DELC. In a Turkish study, 415 patients were examined for the presence or absence of bilateral ELC, angiographic evidence of CAD, and the data suggested that ELC was significantly and positively correlated with CAD. The ELC was an independent variable for CAD. Japanese angiography study by Toyosaki et al. reported that ELC was present in 24.5% of CAD patients, but in only 4.8% of subjects without CAD. However, some other studies have found no such associations and have concluded that the prevalence of ELCs probably increases with age, as does heart diseases. , Davis et al. reported that the sensitivity and specificity of ELC for detecting CAD were 60% and 48%, respectively, and ELC is not associated with CAD. Rhoads and Yano  also found no association between ELC and CAD in Japanese-Americans living in Hawaii. The results of a study by Kuon et al. showed that ELC does not predict a hemodynamically relevant coronary heart disease. It should be noted that the different ethnic and racial backgrounds of populations used in different surveys may relevance of the conflicting results. One of the limitations of the study was not an evaluation of ELC frequency in the non-CAD population; it would have been interesting to compare the findings with subjects without coronary disease. The second limitation was not grading ELC; recent evidence has pointed out to the relationship between the increasing grades of ELC and the increasing severity of CAD. Furthermore, there is no information provided about the extent and severity of coronary disease. According to the results of the present study, the frequency of DELC in patients with CAD was high. The data suggest that the ELC sign may be a useful marker for the presence of CAD in patients. Thus, we propose that ELC may be a useful additional marker for identifying patients with CAD. Agarwal R, Chandra R. The anatomy of the split ear lobe. J Plast Reconstr Aesthet Surg 2008;61 Suppl 1:S114. Frank ST. Aural sign of coronary-artery disease. N Engl J Med 1973;289:327-8. Edston E. The earlobe crease, coronary artery disease, and sudden cardiac death: An autopsy study of 520 individuals. Am J Forensic Med Pathol 2006;27:129-33. Wermut W, Jaszczenko S, Ruszel A. Ear lobe crease as a risk factor in coronary disease. Wiad Lek 1980;33:435-8. Montazeri M, Maleki A, Montazeri M, Rashidi N, Montazeri M, Montazeri M. Is diagonal earlobe crease a marker for coronary artery disease? Heart India 2014;2. [Epub ahead of print]. Evrengül H, Dursunoglu D, Kaftan A, Zoghi M, Tanriverdi H, Zungur M, et al. Bilateral diagonal earlobe crease and coronary artery disease: A significant association. Dermatology 2004;209:271-5. Fisher JR, Sievers ML. Ear-lobe crease in American Indians. Ann Intern Med 1980;93:512. Farrell RP, Gilchrist AM. Diagonal ear-lobe crease: An independent risk factor in coronary heart disease? Ulster Med J 1980;49:171-2. Kuon E, Pfahlbusch K, Lang E. The diagonal ear lobe crease for evaluating coronary risk. Z Kardiol 1995;84:512-9. Zapata-Wainberg G, Vivancos J. Images in clinical medicine: Bilateral earlobe creases. N Engl J Med 2013;368:e32. Raman R, Rani PK, Kulothungan V, Sharma T. Diagonal ear lobe crease in diabetic south Indian population: Is it associated with diabetic retinopathy? Sankara Nethralaya Diabetic Retinopathy Epidemiology and Molecular-genetics Study (SN-DREAMS, Report no 3). BMC Ophthalmol 2009;9:11. Davis TM, Balme M, Jackson D, Stuccio G, Bruce DG. The diagonal ear lobe crease (Frank's sign) is not associated with coronary artery disease or retinopathy in type 2 diabetes: The Fremantle Diabetes Study. Aust N Z J Med 2000;30:573-7. Kwai-Ping Suen L, Lau YK, Ma HC, Lai KW, Holroyd E. Predictive value of auricular diagnosis on coronary heart disease. Evid Based Complement Alternat Med 2012;2012:706249. Bahcelioglu M, Isik AF, Demirel B, Senol E, Aycan S. The diagonal ear-lobe crease. As sign of some diseases. Saudi Med J 2005;26:947-51. Kaukola S. The diagonal ear-lobe crease, a physical sign associated with coronary heart disease. Acta Med Scand Suppl 1978;619:1-49. Toyosaki N, Tsuchiya M, Hashimoto T, Kawasaki K, Shiina A, Toyooka T, et al. Earlobe crease and coronary heart disease in Japanese. Heart Vessels 1986;2:161-5. Gutiu I, el Rifai C, Mallozi M. Relation between diagonal ear lobe crease and ischemic chronic heart disease and the factors of coronary risk. Med Interne 1986;24:111-6. Jorde LB, Williams RR, Hunt SC. Lack of association of diagonal earlobe crease with other cardiovascular risk factors. West J Med 1984;140:220-3. Gral T, Thornburg M. Earlobe creases in a cohort of elderly veterans. J Am Geriatr Soc 1983;31:134-6. Rhoads GG, Yano K. Ear-lobe crease and coronary-artery heart disease. Ann Intern Med 1977;87:245. Lichstein E, Chadda KD, Naik D, Gupta PK. Diagonal ear-lobe crease: Prevalence and implications as a coronary risk factor. N Engl J Med 1974;290:615-6. Motamed M, Pelekoudas N. The predictive value of diagonal ear-lobe crease sign. Int J Clin Pract 1998;52:305-6.